Previous Prev The Host Is... Wrong? I can’t contain this announcement, it’s too huge. My movie-reviewing partner, Steve Schalchlin, and I have to come to the conclusion that the AIDS community doesn’t need new drugs: it needs us. Reviewing movies. Unfamiliar with the Hemo2Homo Connection? The premise is that it’s two guys with AIDS: one gay, one straight. A deadly virus and a love/hatred for movies the only thing in common, they strive to make sense of their own lives and the iffy decisions of Hollywood. Steve- one of the first AIDS bloggers- and I started it as a joke 10 years ago. I was just a young pup, and here’s a couple of old-school photos, the first is our Hemo2Homo promo shot, taken at a mall. Which we quickly overpaid to have printed on a t-shirt and coffee mug. Then: The Siskel and Ebert of AIDS. Now: The Roeper and Rando Dude of AIDS. And yes, I will be trying to sell you Hemo2Homo T-shirts in a few months. 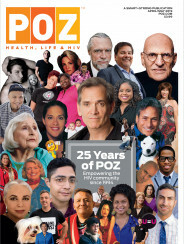 I made a snarky little comment in the book about how Poz Magazine and The Advocate rejected our bids to grace their fine publications with our wisdom and take on The Hours, which some of you have read in My Pet Virus. After that review back in 2003, we went to see Boat Trip- the review of which has sailed off into the Abyss of the internet. After that, the H2H Connection went into hiding until the world was ready for us. Which was 2006. The only problem? We weren’t quite ready for the world again. But before you get too excited, here’s a behind the scenes look at the last time The Hemo2Homo Connection plotted a comeback. Steve had made a Gmail Doc file, which is what I’m asking about in the text below. There is also reference to Steve’s show, The Big Voice, which was going to NYC at the time. HEMO: Hey Homo, what is this? HOMO: This is a magical way for us to write together. First, we login to the world’s richest conglomerate. Then, selling our souls to the “man,” we pretend to be all rebel by slamming their filmic product with our superior minds. I mean, what else is there to do? HEMO: Sounds like a master plan. I heard Running comes out next Friday. I’ll plan on seeing it that weekend, can’t wait. Sharpen that superior mind, the pressure is now on the Hemo2Homo Connection! Skeptics think we shot our wad with The Hours. I don’t know about you, but I got a little wad left. HOMO: You want to know the definition of a skeptic? Someone who is really pissed off that they aren’t you. As for my wad, I prefer Juicy Fruit. HEMO: You said it, buddy. You said it. OK, the movie opened this weekend. I’ll try to see it, but may have to wait til Monday. We should have our review up by a week from today. If Mister I’m Taking My Show Back To NYC can set aside a few minutes to review a movie. HOMO: Well, if Mister I’m A Published Author can get to the movie despite his furious book tour, I’m sure I can find my way. (harrumph). So will there be an actual comeback? Can The Hemo2Homo Connection stay on track and inspire a whole new (and old) generation of positoids with internet connections? Stay tuned to find out!